Sunset catamaran cruise Maiton Racha island. If you are looking for a relaxing pleasure cruise, take a look at this one. There are a limited number of people on each trip and there is a lot of room to relax, walk around the boat and sit where you like. You can relax on the side of the boat, on the front, inside, or up on the top deck lounge where the captain is. This is a wonderful Sunset catamaran cruise that takes you to Maiton and Racha island. After a leisurely cruise from Phuket you arrive at Maiton island where you can enjoy some snorkeling and a swim, most of the time the wild dolphins living in the area come over near the boat for a swim by to say hello, but it is up to the dolphins so you may or may not see them. Before booking our Sunset catamaran cruise Maiton Racha island tour, Please bear in mind that you spend the entire day on this beautiful motor catamaran, you do not actually get off the boat to go on to any of these islands, just off the coast. After you make your way to one of the Racha islands where you enjoy a light lunch on the boat. After lunch you can get back in the water, do some more snorkeling, swimming, and these guys even set up some other water activities for you to use for free such as water slide off the boat, clear bottom kayaks and water toys. As the sun sets you make your way back to Phuket and past Promthep Cap (Phuket’s famous view point) and enjoy a Thai style buffet dinner on the boat before making your way back to the pier. Join us on our Sunset catamaran cruise Maiton Racha island tour. 11.30 Meeting point, KANEANG @ Peir Restaurant @ Chalong Pier enjoy welcome drink. 12.00 Depart from Chalong Pier to Maithon Island. 13.30 Leave Maithon Island for Racha Yai/ Racha Noi Island. Light lunch and snacks and drinks on provided on board. 19.00 Arrive at Chalong Pier. Premium Phi Phi Maya Khai Islands speed boat trip. If you are finding it tough to choose which trips to book, you will not be disappointed with this one. The trip takes you to Phi Phi island, Maya Bay if you are in Thailand at the right time of the year, Then Khai islands. All in the comfort of a fast and comfortable speed boat. Sunset 4 islands Catamaran Cruise Krabi. A wonderful sunset island hopping tour over Krabi’s amazing coastline. Visit 4 islands and watch the sunset over a BBQ feast. Premium Yao Noi Island Catamaran. An amazing day traveling on a beautiful motor catamaran, checking out some islands in the Andaman sea. Visiting a Fishfarm, kayaking, making Traditional Thai desserts. This is a really good fun day out. Full day sailing catamaran Maiton island Tour. If you feel like a really relaxing day sailing on a lovely catamaran, take a look at this tour. Swim, snorkel, see dolphins, an amazing day on the water. Premium Phi Phi Island catamaran. 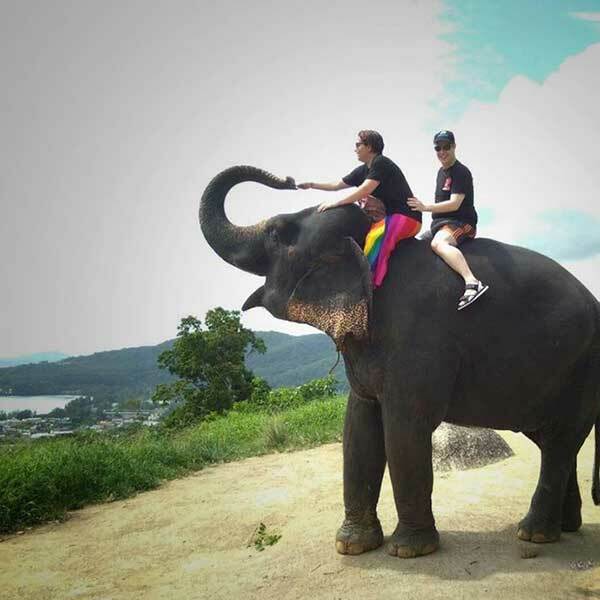 If you are looking to travel in style and comfort, look no further, this is our Premium Phi Phi plus more locations and traveling by motor catamaran. Very smooth ride with lots of room to walk around on the boat. Steps in to the water make it very easy to get in and out of the water and back on to the boat. Premium Hong island Krabi Catamaran. Treat yourself to Premium experience and book yourself on to this Premium Catamaran trip. Smooth comfortable and fast, an amazing way to see the Andaman. Rent private catamaran overnight. If you want to get away for some peace and quiet and experience an amazing island trip off Phuket, you really should look at this one. 2 days and 1 night, roaming the islands and then stop at one of them, and spend the night on this amazing catamaran. Luxury Catamaran party cruise. This is basically a VIP day/ evening club on a luxury catamaran. This is really a great trip to the islands, drinking dancing, swimming, eating and snorkeling, all while sailing on a beautiful sailing boat. Sunset Catamaran cruise Maiton island. 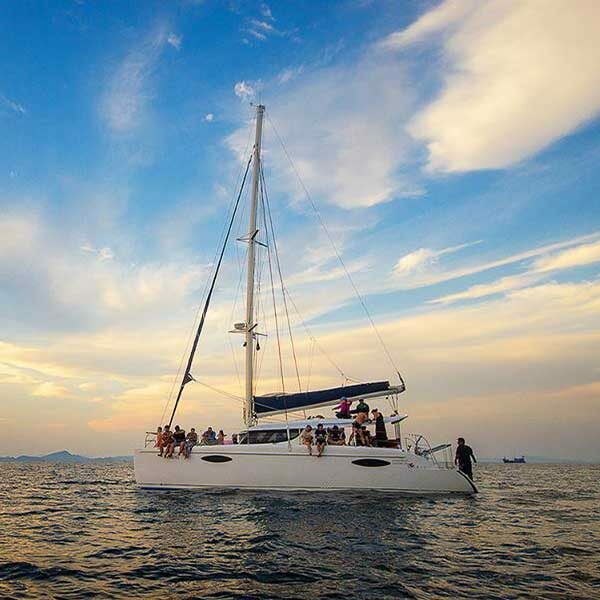 If you are looking for a relaxing day of sailing on a lovely catamaran and round out the afternoon with a Thai style buffet on an island followed by an amazing sunset, check this out.